Thats right. Its not Sidney Crosby's mug an top of the leader board. The dude's name is David Krejci. 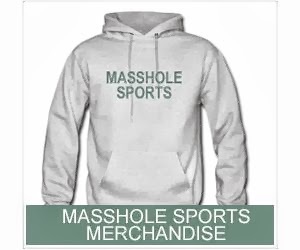 Penguins fans better learn his name and the sports talk radio blowhard in that town better be taught the proper pronunciation (if you're reading this, its DAY-vid KRAY-chee). These people in Pittsburgh need to get their collective heads out of their asses and realize that, first of all, Crosby isnt even leading the NHL in scoring these playoffs and secondly, he will be facing a friggin beast in Zdeno Chara. 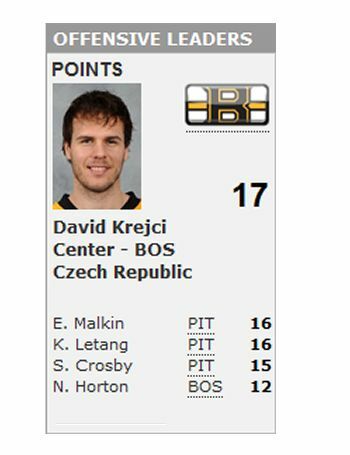 The Penguins have nothing than can stop Krejci. Nothing. The Rangers didnt and the Maple Leafs sure as hell didnt.